BALTIMORE—This fall, the Maryland Institute College of Art’s (MICA) M.F.A. in Curatorial Practice Class of 2015 explore how exchanges between local artists and their neighbors help a community thrive. For LOCALLY SOURCED, five artists based in Central Baltimore’s Station North – Aaron Henkin, Jason Hoylman, NETHER, Wendel Patrick, and Paula Whaley – will showcase newly commissioned works in a variety of media. Through sculpture, sound, photography, and painting, these artists will offer different perspectives on the vibrant and interconnected cultural landscape of the arts and entertainment district. LOCALLY SOURCED will be on view from Tuesday, Sept. 2–Sunday, Sept. 21 in Fred Lazarus IV Center’s Sheila & Richard Riggs and Leidy galleries (131 W. North Ave.), with an opening reception on Friday, Sept. 5, 5–7 p.m. The curators assert: the selected artists are not all activists, nor do they all create specifically community-based project. But their awareness of and engagement with their communities are essential to their working methods. MICA faculty member and public radio host Aaron Henkin, and musician Wendel Patrick collect and collage personal narratives through sound and image. Through Patrick’s work at performing arts venue the Windup Space with the Baltimore Boom Bap Society, an experimental hip-hop collective, and Henkin’s work at MICA and WYPR Radio, they have both embedded themselves in the creative community of Station North. For LOCALLY SOURCED, the duo will work in the neighborhoods of Station North to create a rendition of their previous collaboration "Out of the Blocks," a series that combined experimental sounds, music, and photographs with the oral histories of residents in Baltimore’s Waverly District. Jason Hoylman’s (MICA '07, general sculptural studies) practice relies on his astute observations of space and community in Station North. As he walks his daily routes he records his observations and interactions with different populations, from long-time residents and families, to commuters, students, and business owners. The exhibition will feature different stages of Hoylman’s process, culminating in a large-scale painting interpreting his walks, along with the routes of the people in his network, through Station North. NETHER is a street artist and muralist. His large scale-wheat paste portraits on abandoned buildings and neglected storefronts call attention to local activist voices and tackle social issues such as vacant housing. NETHER sees his environment as a canvas to visually realize his street level connection with people, thus initiating discussion and action. The exhibition will feature a newly commissioned mural highlighting the connection between neighbors in Station North and will be accompanied by portrait paintings. Paula Whaley is a figurative sculptor who uses paper, fabric, and other organic materials to create poignant works. Active in the Station North community, Whaley operates a storefront gallery in her home, exhibiting local artists and providing an intimate learning space for workshops she holds for groups such as Baltimore’s Youth Resiliency Institute. Alongside her studio practice she has fostered an intergenerational ecosystem of healing in her community which directly informs her work. For LOCALLY SOURCED, Whaley will create a large-scale sculptural installation. MICA’s M.F.A. in Curatorial Practice highlights the College’s active role in the Baltimore community. Each year, students work with residents in Station North – one of the nation’s first state-endorsed Arts & Entertainment Districts – to create collaborative exhibitions and programs. Previous Curatorial Practice projects include CONGREGATE: Art + Faith + Community (2013), in which temporary artist residencies were established in five Station North houses of worship, and INVITED (2012), for which site-specific artworks were created in ten non-arts businesses in the District. 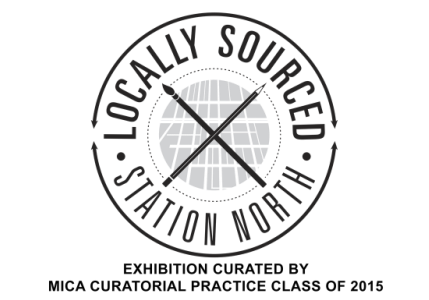 LOCALLY SOURCED is presented by MICA’s M.F.A. in Curatorial Practice program class of 2015, with faculty members Jeffry Cudlin and Gerald Ross. The program allows students to explore new methods of exhibition presentation, thinking outside of traditional models and training to create relevant, timely and accessible exhibitions for diverse audiences. The graduate program is the first M.F.A. in Curatorial Practice in the United States. Curatorial Practice is directed by George Ciscle, MICA’s curator-in-residence and creator of MICA’s innovative Exhibition Development Seminar. Hours for MICA’s galleries, which are free and open to the public, are Mondays–Saturdays, 10 a.m.–5 p.m., and Sundays, noon–5 p.m. Although every effort is made to ensure the completeness and accuracy of the Curatorial Practice-produced press details, information does sometimes change. For the most up-to-date visitor information, visit the exhibition website at locallysourced.weebly.com. This exhibition is made possible partially in thanks to Friends of Curatorial Practice and an Office of Community Engagement grant. For high-resolution images or interviews, contact MICA’s Office of Communications at 410.225.2300. "The artists will highlight their exchanges with the neighborhood. These five artists have been introduced to each other through this project, and we [the curators] examine how the artist’s network overlap – informing, contributing to, and impacting both arts and non-arts communities.” Melani Douglass, co-curator and M.F.A. in Curatorial Practice candidate.